Mary Beth Palkon-Krytzer, RN, is a clinical nurse II in CDU at Beebe Healthcare’s Main Campus in Lewes. As a nurse for more than 37 years, Palkon-Krytzer has always believed in the healing power of music. When she came to Beebe, she talked to her supervisors about ways to bring music into patient rooms. “Many of our patients are older and many may be suffering from dementia. I’ve always felt that having music playing helps relax them and takes them back to a better time in their lives,” she said. Earlier this year, Beebe partnered with the C.A.R.E. Channel®, which offers continuous relaxation imagery and music. This channel is available in all patient rooms. In addition to improving sleep, music also helps with emotional healing, according to research cited by Psychology Today. Studies show that music can slow the heart rate, reduce blood pressure and cortisol levels. It can also help those suffering from depression, anxiety, and chronic pain. The station, which can be found on channel 12 in all Beebe patient rooms, does not include advertisements and adjusts based on the time of day. At night there are star sequences and in the morning, the sun rises and birds began to chirp. 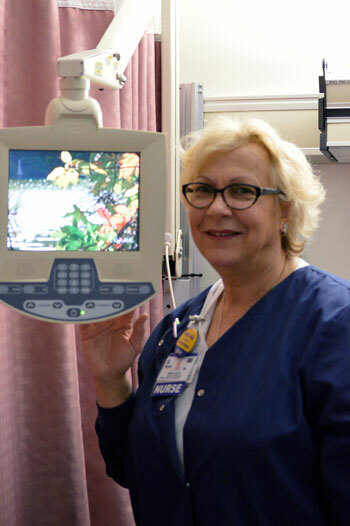 “The channel really puts everyone in a better mindset and helps drown out the machines and other hospital noises,” said Palkon-Krytzer, a Philadelphia native who moved to the Lewes area about five years ago to live near the beach. The C.A.R.E. Channel® is in use at more than 800 hospitals and healthcare systems. At Beebe, the channel is available 24 hours a day, seven days a week, on channel 12. For more information on the C.A.R.E. Channel®, go to https://www.healinghealth.com. For more information on Beebe Healthcare, go to www.beebehealthcare.org.